I am going to come right out and say it: The drug most closely associated with my field of medicine is one of my least favorite medications in all of medicine. 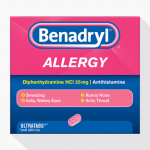 Diphenhydramine (you probably know it by it’s brand name Benadryl) is the little pink tablet or liquid that everyone, including most physicians, associate with the treatment of anything allergic. You get itchy – take Benadryl. You get stuffy – take Benadryl. You start sneezing – take Benadryl. You have an allergic reaction – well obviously Benadryl is your only choice, right? Enough is enough! Diphenhydramine was first marketed in 1946. It was discovered by a University of Cincinnati professor named George Rieveschl during a quest to find a medication to treat muscle spasms. It has remained the most popular allergy medication in the United States for over 60 years. But why? Diphenhydramine causes drowsiness. Most people know that. Besides being sold as Benadryl, it is also sold as Unisom – a sleep aid. Diphenhydramine causes greater driving impairment than alcohol. Let that sink in. It causes dry mouth, urinary retention, hallucinations, learning impairment and any other number of side effects. Yet, the myth that it is the “go-to” agent for anything allergic persists. Part of this myth is rooted in culture and part in medical education. The fact that Benadryl has been an over-the-counter medication for so long, and thus has been readily available without the need to consult a doctor, means that three generations of parents have given their children (and themselves) Benadryl because “that’s what my parents did” (Remember: a lot of our parents smoked and drank while they were pregnant too). The reason that this persists is because doctors don’t tell patients otherwise. In fact, most encourage the use of Benadryl for any type of allergic problem and often for problems that have nothing to do with allergy. For instance – have you ever been told to give a child with a cold Benadryl to “dry them up”? Yeah that doesn’t really work. Medical education regarding allergy in general and more specifically the pharmacology of antihistamines (how they work, how long it takes them to work, and how long they last) is extremely lacking. Thus the myth persists. We now have four newer, second generation antihistamines available as over-the-counter products that do not require a prescription. Loratadine (Claritin), cetirizine (Zyrtec), fexofenadine (Allegra), and levocetirizine (Xyzal). These are much more specific binders to the type I histamine receptor and thus retain the histamine-blocking power of diphenhydramine, without a lot of the nasty side effects. Sounds good right? Well why aren’t they used more? There is this pervasive myth that only diphenhydramine works fast enough to be used for acute allergy problems. This is entirely untrue. Cetirizine and levocetirizine reach peak efficacy about 20 minutes quicker than diphenhydramine does. Fexofenadine and loratadine are not far behind. One thing that doctors have been right about is the old “Take Benadryl every 4 hours if you have symptoms”. Doesn’t that sound fun? That sounds like a great way to spend a day – taking a medication that is going to cause extreme sedation every 4 hours! So much for being productive at work or school. And let’s not mention the dangers of getting behind the wheel on that regimen. But in order to maintain it’s effectiveness, it must be taken that often due to it’s short duration of action. All of the second generation antihistamines last several times as long and all are marketed for once daily use. I recently saw someone label diphenhydramine as a medieval drug. I firmly believe this is true, yet it still remains atop the throne as king of allergy medications. It’s going to take a generation of informed parents, and better education of our young doctors and nurses to change the misinformation that diphenhydramine is the best and only drug to treat allergic symptoms.